Have you ever attempted to crop MP3 files to make a ringtone but failed in the end? Have you ever tried to crop a chunk of music files to make a mix of songs? Have you wanted to crop an MP3 to make alarm music? At this time, you must be wondering if there is any way to crop MP3 files. Hence, today’s tutorial will lead you how to crop MP3 files online and offline. Without the need to register online and install the software on your computer, Online MP3 Cutter is a free MP3 cropper online that can help you crop music in any formats like MP3, WAV, OGG, etc. You can quickly crop MP3 files in a few clicks. Next, let us start to learn how to crop MP3 online with this MP3 Cropper. 1. Go the website: http://mp3cut.net/, choose the big blue button "Open file" to import the MP3 file you need to crop. 2. Drag the left and right edge of audio track to the position you want to crop, then click the green button to play the audio. If you are content with the sound clip, you can choose the output format (MP3, AMR, WAV and AAC) before the blue button "Cut". At the top, you can choose "Fade in" and " Fade out" modes. 3. 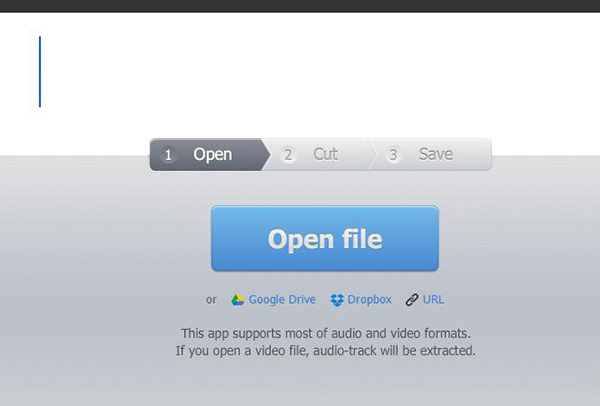 Start to crop MP3 online by clicking the blue "Cut" button to cut. 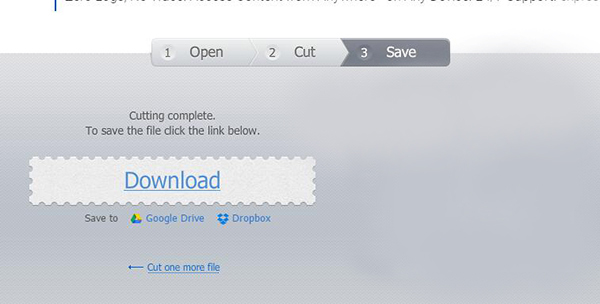 After it finishes cropping MP3 online, you can click "Download" to download the file. 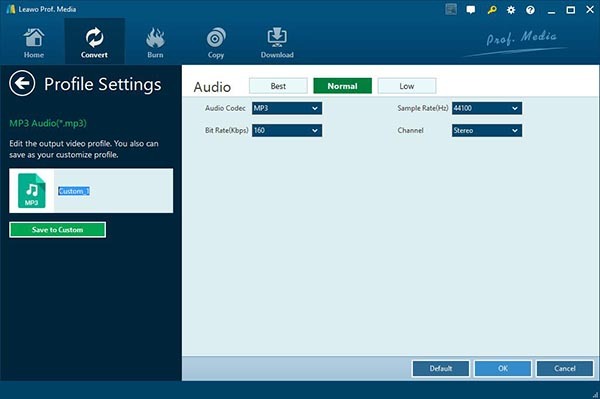 When it comes to MP3 cropper online, MP3 Cutter facilitates you to crop MP3 files without the need to decode MP3 files. It supports the output format of MP3 or M4R for iPhone. Whenever you want to make a ringtone for your iPhone, you can simply open this MP3 cropper to crop MP3 files online. Similar to MP3 Cutter Online, Audio Trimmer doesn’t require users to register and install the software. The interface of the MP3 cropper is so simple that you could easily learn how to crop MP3 file in a few clicks. With this MP3 cropper, you can easily remove the unwanted part of sound clips and crop the clip of your favorite song as you like. MP3 Cutter Online is specially invented to crop MP3 files, lectures and audio books to make your DIY ringtone. The online MP3 cropper doesn’t require you to download and install the software. It supports to crop music files in MP3, WAV, OGG, etc. If you want to enjoy free cropping service, then MP3 Cutter will be a good choice for you. Leawo Video Converteris the best MP3 cropper offline for you that supports to convert audio to many popular formats like MP3, WAV, FLAC, etc. It is powerful in providing you with editing features to add special sound effects, trim video to millisecond, crop audio to precise size, adjust audio volume and set audio parameters like bit rate, sample rate. Now let’s learn how to crop an MP3 file with Leawo Video Converter. Download and install Leawo Video Converter on your computer. 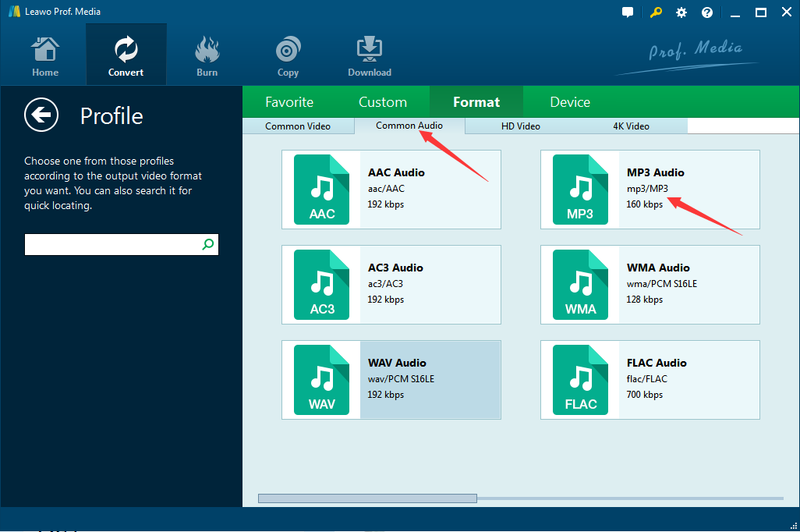 The below steps show you how to crop MP3 files on computer with Leawo Video Converter. 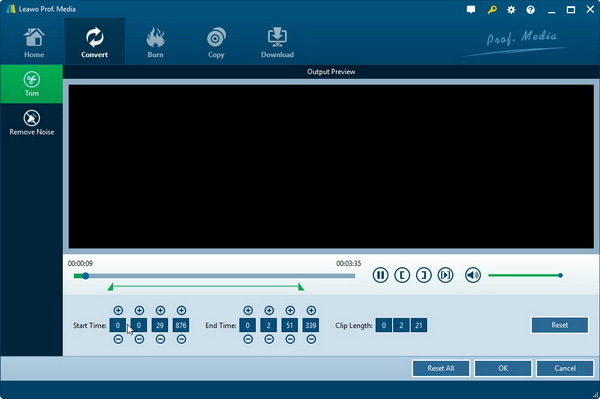 Launch the software and choose "Video Converter" or click the icon next to Home at the top to enter to "Convert" panel. Click "Add Video" at the top bar to import the MP3 file you want to crop or directly drag the music to the marked area. Click the drop-down box next to "Add Photo" and choose "Change". 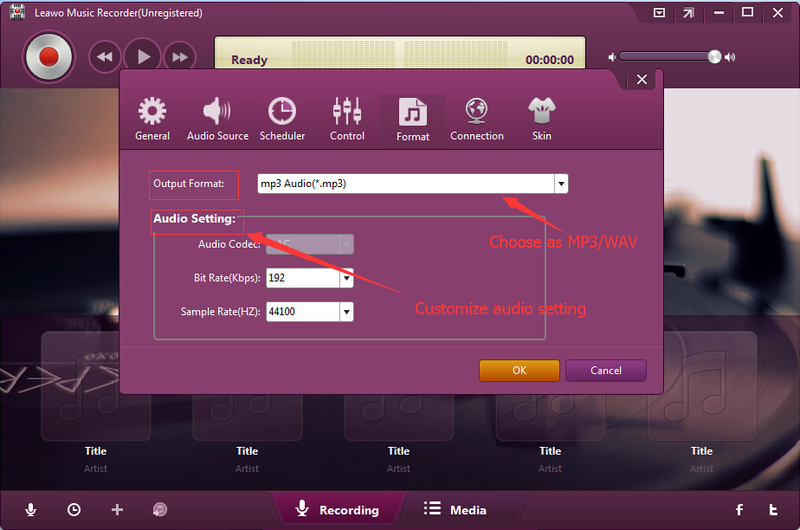 Then choose "Common Audio", you will see many different output formats like AAC, MP3, etc. Choose MP3 as the output format. If you want to make ringtone on iPhone, you can choose M4R as the output format. Back to the drop-down box next to "Add Photo" and choose "Edit" so as to enter the "Profile Settings" panel. You can change bit rate, sample rate and audio codec here. You will see "Trim" and "Remove Noise" and choose "Trim". Then you can click the playing button to choose which position to start and stop. There are two ways to set the length: one is to drag the green cursor below the playing bar; the other is to set the start time and end time. Click "OK" and go back to the main interface, then click the big green "Convert" to start to crop MP3. A sidebar will pop up to ask you to select the target output directory. Select the target output directory and then the software will start to crop an MP3. Remember not to click "Cancel" button. 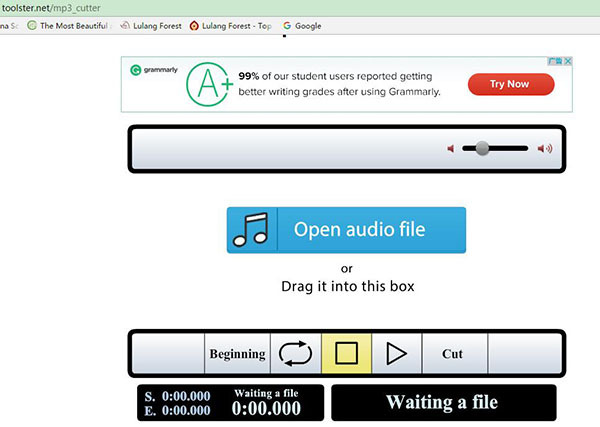 Leawo Music Recorder is an all-in-one tool that can crop audio from any audio sources including online audio, computer audio and microphone audio. It supports to crop music in over 300 formats like MP3, MP4, WAV, etc. The MP3 cropper has built-in Auto-filter to remove ads in the recording and Task Scheduler to automatically record sounds by setting the start time and duration. 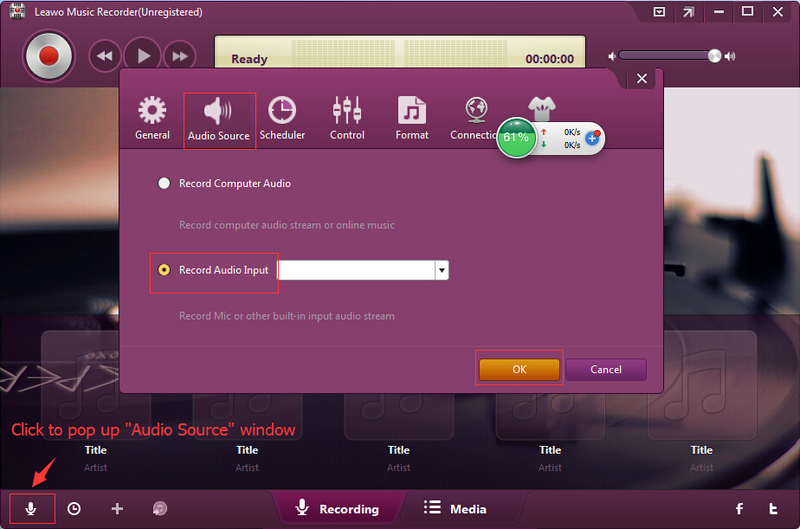 Leawo Music Recorder allows you to choose software language and change skin. Besides, you can change the parameters of bit rate and sample rate to enhance your sound quality. 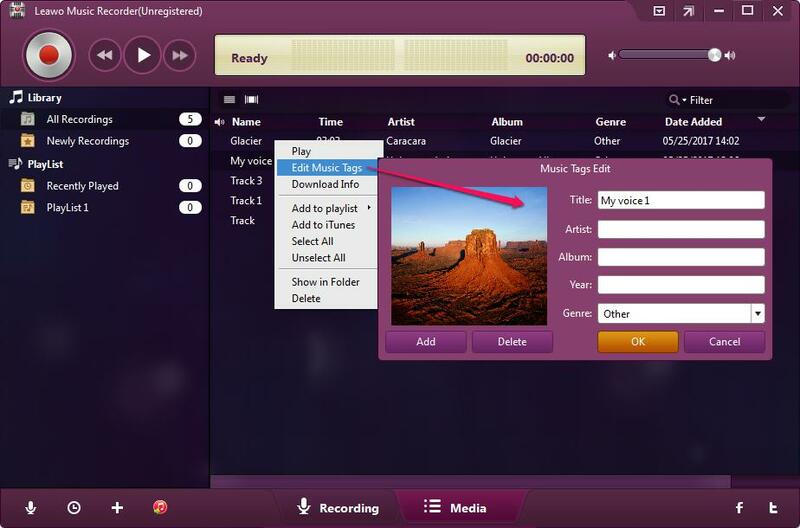 The following steps will illustrate how to crop MP3 files with Leawo Music Recorder. Download and install Leawo Music Recorder. 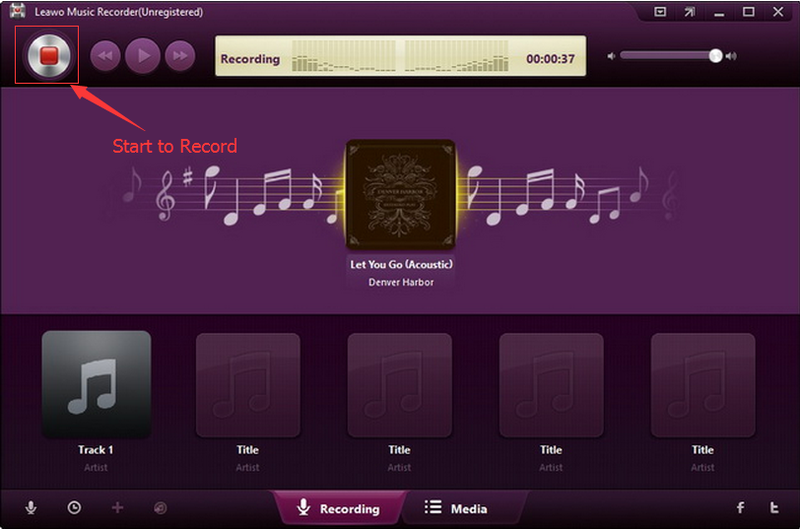 The below steps would show you how to crop MP3 files with Leawo Music Recorder. Click little drag-down icon in the top right of the interface to enter "Settings" or microphone icon at the bottom left corner to enter "Audio Source", then go to "Format" to choose output format as MP3 or WAV and change the parameters of bit rate and sample rate. Afterwards, go to "General" to select the target output directory. Go to Settings > Audio Source and "Record Computer Audio" and "Record Audio Input" are available. Choose "Record Computer Audio" here. Play the audio until the start point you need to crop appears, then click the recording button. Press the recording button to stop the song where you want to end. Music tags can be automatically downloaded and added. If needed, you can also right click the MP3 song clip you crop and choose "Edit Music Tags" on the media panel to edit music tags like title, artist, year and genre.